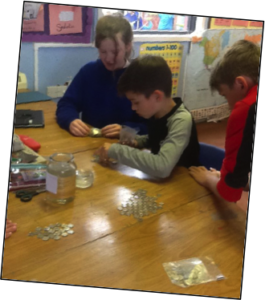 Llangorse School: How £2 became £3,356.10! In April 2017, Size of Wales was invited to Llangorse School, as year 3 were studying rainforests. Our outreach worker Nigel Little delivered an assembly to all pupils, then Foundation Phase pupils enjoyed the interactive forest elephant workshop, where they learned about small forest elephants and how they are protected. The Key Stage 2 workshops focusing on tropical forests and climate change, complementing year 3’s rainforests work and that of the older pupils, who were learning about climate change. In the workshop, pupils discovered how important trees are in the fight against climate change, the threats to tropical forests and what Size of Wales is doing to help protect them. The pupils’ imagination was captured when they heard about our projects, which range from land rights in Guyana, to supporting communities, gorillas and forests in the Democratic Republic of Congo and tree planting in Uganda. Following Nigel’s visit, the eco-committee decided they wanted to raise funds to help Size of Wales protect tropical forests because ‘climate change is important’ and ‘Nigel was fun’. They were concerned about animal habitats disappearing and that some of those may house ‘species scientists haven’t even found yet’. The head teacher gave each of the 85 junior pupils £2 to take part in an enterprise project during out of school hours. Each pupil wrote a business plan, taking into account costs and predicted sales. They were very creative in their ideas, which ranged from washing cars and sponsored walks to making cakes, bookmarks and pencil cases. How much did they raise? At the end of the allotted time, £2 was returned to the head teacher and the eco-club counted the profits. 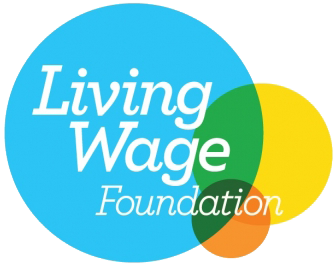 Pupils had raised an amazing £1,678.05! Back in the Size of Wales office, we were astounded. This was the biggest single amount raised by a school; in fact, Nigel thought it was a typing error when he received the email from the school! Even better, the amount will be doubled by our funders to bring it up to £3,356.10, enabling us to help protect even more tropical forests. Thank you Llangorse School! 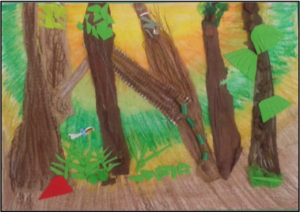 The workshops raised pupils’ awareness of climate change and tropical forests and inspired them to take positive action. Setting up their own businesses developed their numeracy and creativity skills, their confidence in their abilities and themselves. Go Green Day 2017: Robin’s Rainforest AppealGo Green Day 2017: Minuteman Press, Success!